After 20 years, the 1995 Middle East resolution designed to establish a wmd-free zone remains unimplemented. Based on a report by non-proliferation expert Dr Tytti Erästö for the Stockholm International Peace and Research Institute, which addresses the prospects for a WMD-free zone at the NPT Review Conference 2020, we take a look at countries’ current positions on a WMD-free Middle East. Based on a SIPRI report that addresses prospects for NPT RevCon 2020, we take a look at countries’ positions on nuclear disarmament in the Middle East. Credit: CTBTO. The Non-Proliferation of Nuclear Weapons Treaty (NPT) has remained largely unimplemented since its formulation in 1968. Despite successive NPT Review Conferences (RevCon) every five years since 1975 and intermediary Preparatory Committees (PrepCom), many of the major issues, such as non-proliferation and nuclear disarmament in the Middle East, have failed on the basis of political deadlock between regional actors, as well as depository states – namely the UK, the US and Russia. According to non-proliferation expert Dr Tytti Erästö, writing in a report commissioned by the Stockholm International Peace and Research Institute (SIPRI) the 2015 Joint Comprehensive Plan of Action (JCPOA) could have effectively been a blueprint for all states in the Middle East to follow in terms of nuclear disarmament, evidenced by Iran’s adherence to its guidelines. However, the US’s recent withdrawal from the JCPOA has compounded issues for the WMD-free zone, and now states are to return to the drawing board to see if some of the political deadlock can be broken. The erosion of the JCPOA, nuclear disarmament, and regional security will no doubt be back on the agenda at RevCon 2020. The US shares the perspective that Iran’s nuclear programme is more of a threat to stability in the Middle East than Israel’s nuclear disarmament. The US cancelled the 2012 Helsinki conference, citing regional disagreements between Israel and Egypt over a broader regional security dialogue. It stated that a WMD-free zone could only be established once “durable peace and full compliance by all countries in the region with their non-proliferation obligations” was achieved. Since the US left the JCPOA last year, government statements have indicated that the US is more interested in sanctioning Iran than establishing a consensus for a WMD-free zone process. The US also withdrew support in 2018 for the implementation of the 2010 NPT RevCon resolution, saying that “the recommendations on the Middle East contained in the Final Document of the 2010 RevCon, while well-intentioned, can no longer be considered an appropriate basis for action on this issue”. The UK has recognised that a WMD-free zone in the Middle East would “contribute significantly to regional and global security”. However, the UK agreed with Russia and the US that the establishment of a WMD-free zone by international pressure, and against the will of regional actors, would erode the sovereignty of Middle Eastern states. This was reiterated by the three countries at the 2015 RevCon to account for the apparent lack of implementation of 2010 RevCon commitments. The UK reaffirmed its support for a WMD-free zone in 2017 and 2018, noting it was prepared “to actively support and facilitate renewed dialogue aimed at bridging the differing views in the region on arrangements for a conference”. However, the country believes any substantial move to create a WMD-free zone is dependent on Israel’s consent and involvement. Controversial debates at the 2018 Preparatory Committee highlighted divergent views of the depositary states, which will need to be overcome at RevCon 2020. Egypt ratified the NPT in 1980 based on the hope that it “would encourage Israel to follow suit, especially as all Arab countries neighbouring Israel had already become party to the treaty”, according to Mohamed Shaker, Egyptian Ambassador to the UK from 1988 to 1997. The Egyptian Government has championed the belief that the NPT is inherently linked to the Middle East resolution established in the 2000 NPT Review Conference, and effectively enshrined the NPT into law without a formal vote from signatories. 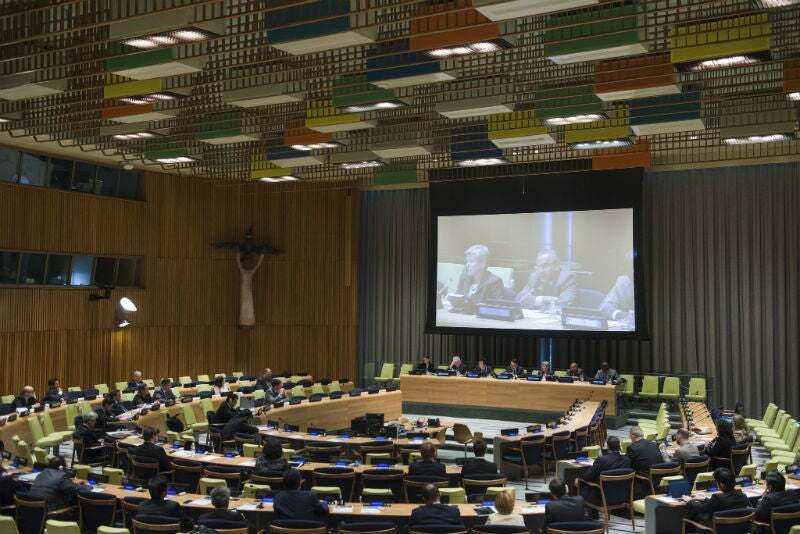 Egypt became frustrated with the lack of implementation of the NPT and its delegates walked out of the 2013 PrepCom claiming that some states were not fulfilling their commitments and ignoring the severity of degrading political stability in the region. Egypt has been in favour of a UN-led process of nuclear disarmament and may therefore oppose a broader security dialogue, which does not prioritise a WMD-free Middle East. Israel has not supported the international community’s attempts to establish a WMD-free zone in the Middle East. It has neither signed the NPT Treaty, nor signed a comprehensive safeguards agreement with the IAEA, despite holding membership since 1957. Despite its refusal to participate in the 2012 Helsinki conference, Israel indicated its support for the general nuclear disarmament dialogue, as part of a greater discussion on region security. In a communication to the IAEA in 2014, Israel said that a direct dialogue with all Middle Eastern states should be undertaken “to address a broad regional security agenda, based on the indispensable principle of consensus between the regional parties”. Israel views nuclear proliferation as a barrier to nuclear disarmament and had joined calls from other Western nations to impose limits on Iran’s nuclear programme in the form of the JCPOA. The Israel Atomic Energy Commission noted in 2016 that “despite the recent [JCPOA] agreement, Iran continues to be a destabilising force in the Middle East” and accused Iran of “blatant concealment and duplicity” in its weaponisation activities. Including Israel will likely be on the agenda of the 2020 NPT RevCon, but Arab states’ aversion to negotiate on Israel’s terms, along with related issues such as the recognition of Israel or the Israeli occupation of the Palestinian territories, could hinder further cooperation. Saudi Arabia has been less vocal than other states over the lack of implementation of the 1995 Middle East resolution. However, frustrations emerged at the 2015 RevCon when Saudi Arabia openly warned that any further delays in creating a WMD-free zone could complicate the already unstable regional situation and create a potential nuclear arms race. Saudi officials said it was “imperative that the states do not experience any doubts or concerns about the wisdom of accepting an infinite extension of the NPT treaty, or even the accession to it”. In this way, Saudi Arabia agreed with Egypt that extending the treaty was important for regional stability. Saudi Arabia, along with the UAE, continues to endorse US President Donald Trump’s hard-line policy on Iran, including recent oil export sanctions, but it has never supported sanctions on Iran in the context of the NPT. In May 2018, Saudi Arabia’s Ministry of Foreign Affairs said “Iran used economic gains from the lifting of sanctions to continue its activities to destabilise the region, particularly by developing ballistic missiles and supporting terrorist groups in the region”, effectively echoing Trump’s condemnation of the JCPOA. Iran, along with other Arab states, has been calling for a UN General Assembly resolution on a WMD-free Middle East since the 1970s. The country also advised the IAEA to create its own resolution urging Israel to sign the NPT Treaty and ensure its nuclear facilities adhere to IAEA safeguards. Above all, Iran views Israel’s nuclear monopoly in the Middle East as the major barrier for a nuclear weapons-free zone. Iran has contrasted the concerns vocalised by most members with the “deadly silence on [the] Israeli clandestine nuclear weapon program”, claiming uneven treatment. This was also highlighted in Iran’s response to the postponement – and later cancellation – of the 2012 Helsinki conference, with Iranian officials declaring that it was the US’s attempt “to protect Israel from international condemnation” and that the US “has always supported [the] Israeli regime at any price”. Despite the US pulling out of the JCPOA last year, Iran continues to commit to the restrictions on uranium enrichment activities enforced by its guidelines, according to successive reports from the IAEA. If Iran were to withdraw from the JCPOA, the repercussions could lead to a nuclear crisis and would pose additional challenges for a WMD-free zone. Russia supports the idea of nuclear disarmament negotiations going ahead without the inclusion of Israel as a necessary condition. Before the Helsinki conference was cancelled in 2012, Russia did not agree with the US and the UK that the lack of unanimous consent from regional actors (i.e. Israel) was a precondition for its postponement. Later, Russia noted that seeking the establishment of a WMD-free zone in the Middle East only after total stabilisation in the region was “utterly erratic” and “counterproductive”. The political deadlock resulting from the 2015 NPT RevCon concerned Russia, which argued that “further inaction in that area threatens to undermine the confidence of states in the NPT”. Nonetheless, Russia fully supported the draft resolution resulting from the 2015 RevCon. Russia noted that a regional conference to establish a WMD-free zone by 2020 was still on the table, and called for preparatory meetings to work towards it. As an incentive for Israel to participate, Russia said one of the sessions in the conference would be dedicated to regional security. It urged the US and the UK to “take the same constructive position”.